You know when you're at Elton concert right up the front and your hands are flailing for whatever may be flung from the stage? Whether it be picks or sticks we're always grateful to get them. But the main man, due to the nature of his power plant, can't throw pieces of it willy nilly at the audience. The insurance wouldn't cover it for a start...but now there is a chance to own a piece of it. You want a piece it...here's how. I've mentioned before on this blog about how Elton's piano's are subjected to the most severest of tests night after night on tour. They never flinch but once in a while an upper cut is opened or in more technical terms a string breaks. Not a regular occurrence due to excellent maintenance of quality machinery but when they do reach the end of their natural life they now have a good home to go to. Maybe even yours. Traci Loving of Imagine Loving Art, friend of JW&AT and artist in residence for the EJ Band, has created something unique and a collectible that hasn't appeared before and is unlikely to appear regularly in the future. Traci is an artist of exceptional taste, her range of Elton related items, not to mention items of other rock artists, is well known at this time. Whether it be hand crafted jewelry or drawing and paintings. How high up the appreciation ladder has she reached? Next time you're at or watch the Million Dollar Piano on DVD then check out Davey using the 'Mandolisa' on Mona Lisa's And Mad Hatters. Yep, she designed and painted that. I'm pleased to say I own an item of Traci's and would recommend her work to anybody and have done so many times. Because of her connections to the main man she has been granted access to the old wires and rather than have them chucked into the bin marked 'to be melted down' she's put her skilled hands to work and come up with this amazing piece of work. 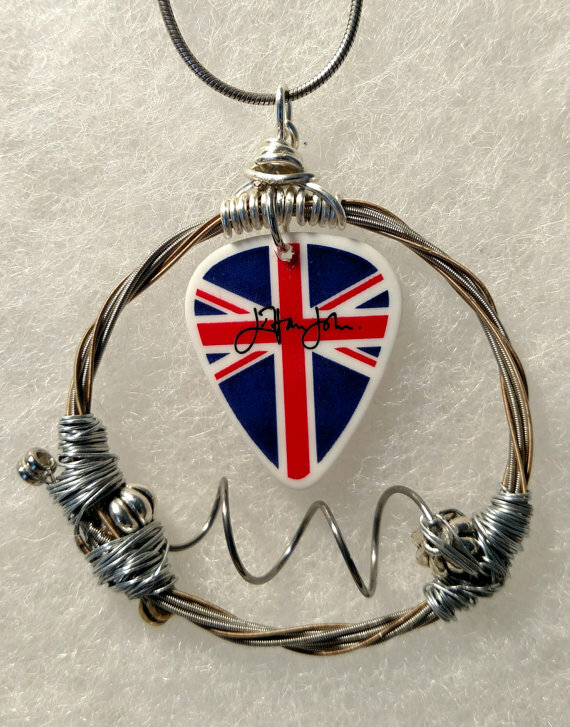 High tensile metal that has been woven to create a necklace, the centre piece being one of Davey's many colourful guitar picks. Kind of appropriate that both musicians tools have been blended together to seamlessly create another tendril of art in a similar manner as their music relationship has existed for 45 years or so. This rescued string has been taken from one Elton's many tour pianos. This is from 'Kay', Traci has all the details about it on her listing in the links provided. So when you're wearing it around your neck and if you listen carefully then you may hear the faint trickle of a note long since died but like the stars in the night sky will keep on shining forever. Because it certainly has some tales to tell, if it could sing. Sing it didn't but play it did and because we don't get the chance to own something that has come from Elton's workbench too often, if ever, then the chance to own this may not come along any time soon. Yamaha's terrific expertise in keeping the show on the road testifies to that. Traci has created a simple yet iconic looking design, the wire itself is the main facet of the design and speaks for itself. The red, white and blue guitar pick adds some tasteful colour, almost at the heart of the piece. The 'Elton, Davey' relationship characterised very dramatically ...so hurry up and get it while you can. It may be a while before before the hammer hits...too hard again! But the good work doesn't stop here...and here's another exclusive for JW&AT. She's already raided one of Nigel's old cymbal's and chopped them up into baby cymbals. As you can see from the picture she has laser inscribed his 'Little Bloke' logo into it with incredible accuracy and detail. Some will have be done on one side whilst others will have a Nigel on both sides. Like his double kick drum...these will available very soon in her store as a pendant with a gold chain. I suspect these will be highly sought after, Nigel does have large following. Traci has conjured up some incredible original designs, who would have thought the band throwaways would be recycled in such a cool way. To rework the old phrase, reduce, recycle and rock on!! 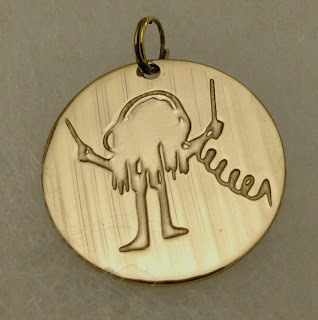 How can I purchase a Nigel Olsson charm? Hi Jacklyn, all the details are on the links at the bottom of the post.